2017 began in a very positive way in the Health sector. The Municipality of Baucau has now a regional hospital, also benefiting the surrounding communities, particularly in the municipalities of Viqueque, Manatuto and Lautém. Baptized Eduardo Ximenes Regional Hospital, the name derives from the Vice Minister of Health of the Unilateral Government of 1975, which, at the time of the Indonesian invasion, imbued with a spirit of nationalism, patriotism and professionalism, gave his life to the liberation of the people of Timor-Leste. During the opening ceremony, the Vice Minister of Health, Ana Isabel Soares, pointed out that the construction of this hospital unit began in 2007, when the current Prime Minister, Rui Maria de Araújo, was Minister of Health and Deputy Prime Minister in the 2nd Constitutional Government. The Vice Minister stressed that the fact that the construction of the Eduardo Ximenes Regional Hospital is now complete does not mean that the obligations of the Government to that hospital unit have ceased. Thus, the Ministry of Health will support differentiated services for prevention and treatment, diagnosis and therapy, hospitalization and emergency. Ana Isabel Soares assured that there will be no lack of medicines and human resources will be sufficient to meet the people’s health needs. The hospital has 227 staff: 98 nurses and 12 assistants, 22 midwives, 25 doctors and two specialists, among others. It should also be emphasize the presence of 13 elements of the Cuban Medical Brigade. 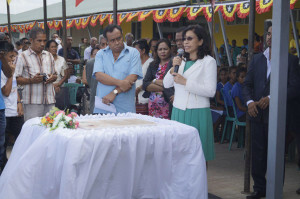 The Minister of Public Works, Transport and Communications, Gastão de Sousa, other members of the Government, Members of Parliament, religious entities, the Director of Health Services of Baucau, representatives of civil society and of the community, relatives of Eduardo Ximenes and other guests attended this ceremony.